The real key is it’s not about being ON social, it’s about BEING social, but make sure you have the right people on your team to talk for you. There is a difference between driving business FROM social media sites and driving business THROUGH social media sites. Customers are getting better-and-better at ignoring marketing “interruptions.” Inbound marketing today is about “getting found” using Google, blogs, and social media on the Web. Shows up when the audience members are having conversations about the industry, the company or anything at all really. It is about having a seat at the table. You have to give to get with remarkable content. Today your marketing effectiveness is a function of the width of your brain. Think of yourself as half marketer, half publisher. Blogging is one of the best ways to create remarkable content. A blog shows that you are a thought leader in the industry, makes your website dynamic, and gives your potential customers a way to engage with you (versus being hit with a sales pitch). You can build trust with customers over time with a blog. Blogs also dynamically improve your search rankings and provide a medium that other bloggers are much more likely to link to than a product page on your website. Videos are a great way to give a sneak peak behind the screens of a company and make people feel like you are more real and approachable. Videos should be less than two minutes, accompanied by text descriptions and posted on the blog. In general video views drop by about 1% per second for the first minute or so (10.4% @ 10 sec, 55% @ 60 sec, etc). Simply posting any video does not mean it will be watched from start to finish. “Give more than you expect to receive out of twitter,” and to ask the question, “How many people can I engage in a dialog with?”. 20% about yourself 80% about everyone else on social media is the rule. Share your thoughts and findings. Find awesome people to follow. You can use wefollow.com and other sources (there used to be a site called twellow, but it has closed down). Twubs.com and WhatTheTrend.com are great resources for tracking what people. Start using Hootsuite or bit.ly to track your links and see what people actually click upon. For monitoring, check out SocialMention.com and google.com/alerts. Set up some alerts for our topics (i.e. Solar, WasteWater Efficiency, things like that). You can receive email alerts when something new pops up. For instance, any time my name appears on the web somewhere new, I get an email letting me know someone is talking about me. Find and follow 25+ influencers in that value stream already on Twitter (i.e. people in California Solar, CleanTech, Efficiency, Municipal, and Energy spaces). The Great Depression http://wp.me/p23JPv-qg via @sking1145 Good post, but not sure this shows that things are as bad as the Great Depression. Similarly engaging content as found and posted on Twitter should be posted to the Facebook page, but not as frequently (say once per day) without handles, though Facebook now recognizes hashtags. 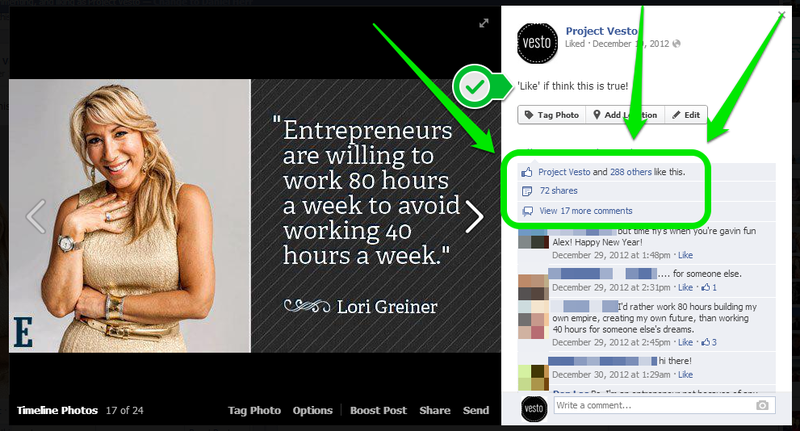 Project Vesto post: “Entrepreneurs are willing to work 80 hours a week to avoid working 40 hours a week.” – Lori Greiner. Comment on say 2 blog posts per day with insightful and relevant thoughts. DO NOT just comment to comment or spam with a bunch of links back to your homepage. If you have nothing to say, keep that nothing to yourself. RT @zshahan3 Going Solar Is Getting Popular — Check Out These Charts! http://dlvr.it/3fT4nn @solarloveorg #solar – makes me love my job! Spend less time searching and more time engaging. While you obviously want to make the most of this experience, the priority with social media is action over precision. Between searching, listening, creating content, sharing content, and engaging with folks don’t spend more than one to two hours in the day (though when you are first getting started I understand it taking a little longer ). A person could spend all day doing this stuff, but that wouldn’t be the most effective use of all of their time. Don’t end up in analysis paralysis in searching for the perfect people to follow or engage. Take the startup culture mentality by getting 60% of the way there and then acting and testing your hypotheses. and The Thank You Economy .